"The best brownies ever! This is a very cakey version." In a large bowl, stir together the flour, sugar, baking soda and 1/3 cup cocoa. In a small saucepan, combine water and 2/3 cup of butter; bring to a boil. Allow the butter and water to cool down a bit before adding to the dry ingredients. Beat in the buttermilk and eggs last. Spread evenly into the prepared pan. Bake for 30 to 35 minutes in the preheated oven. Allow to cool for 20 minutes before frosting. To make the frosting: In a large bowl, stir together the confectioners' sugar, 1/3 cup cocoa, milk and vanilla until smooth. Beat in the melted butter until light and fluffy. Spread over brownies while they are still slightly warm. Cut into squares when cool. Good, easy to make but very much like chocolate cake. If you prefer a more fudge like brownie then skip this one. This is actually a delicious cake recipe I've usually seen as "Texas Cake". However, I wouldn't call them brownies at all. Cake-like texture, neither too sweet nor too chocolatey. My kids ate them with whipping cream instead of frosting and the pan was clean. These were soooooooo good! I just made a couple of adjustments! Used 3/4 cup of cocoa & milk instead of buttermilk! Yum!!! 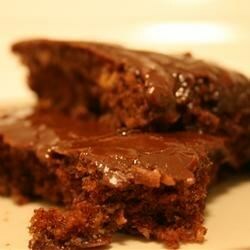 I loved this recipe, very like cake taste, but what is a 'Texas Brownie'? Definitely a cake, not brownies. But VERY GOOD! I added, 3/4 c. cocoa (instead of 1/3) Vanilla All I had was almond milk (no buttermilk) so I used that. Very good though!